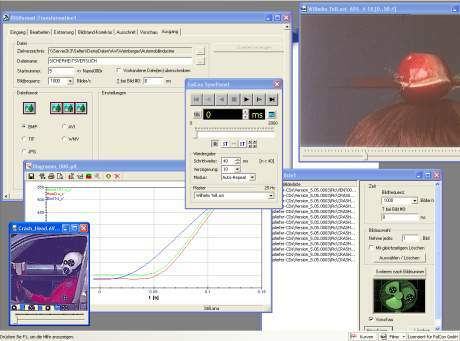 The FalCon AVICreator module provides both quick creation of image sequence files as well as convenient viewing with the use of a sequence and measurement data viewer. Digital sequence pictures can be prepared and improved to create a "Video for Windows" file (AVI) from them. FalCon AVICreator’s batch capability makes automatic processing possible. Titles and logos created with a graphics program as well as texts and time values can be inserted. AVI files are created (on request) uncompressed and thus without any loss in the individual images. A viewer for AVI files (Sync Panel) enables to watch several videos simultaneously. The replay speed and size of the picture can be changed as well. Also functions for single steps, positioning, autorepeat and playback of sections are available. A 3D viewer allows to show trajectories including error ellipsoids. Save the displayed data with all the used settings as a document. Handle the 3-dimensional data cube via interactive mouse rotation, translation or zoom. It is also possible to represent measurement data as time diagrams. The handling of the measuring data viewer is very easy by the changeable attributes and adjustable curve parameters. The layout can be stored together with the measuring data as a document. As soon as an AVI file is played back with the aid of the Master Panel, a synchronized value cursor follows not only in the time diagram, but also in all curves = f(t). When this marker is moved interactively, the AVI files are also automatically positioned to the corresponding picture. A viewer for ISO MME measurement data is included!